Here are all the major stats and numbers that were recorded during the thrilling Sydney T20I. India ensured they didn’t let Australia win the T20I series winning the final T20I by six wickets to draw the series. Contributions from everyone in the batting order helped the Australians finish on 164/6 after electing to bat first. On the Sydney track that was slowing down, the Indian openers added 67 in just 5.2 overs. However, the hosts kept things tight and India were reduced to 108/4 by the 14th over. But captain Virat Kohli anchored the chase along with Dinesh Karthik to take the team home with an unbeaten 60-run stand for the 5th wicket. 1 – This is the first International series/tournament with 3 or more matches under Virat Kohli’s captaincy where India played with only 11 players. Kohli fielded only 11 players in the home T20I series against the Aussies last year in which the 3rd T20I was abandoned. Overall, this is the 3rd time India made no chances in a T20I series/tournament of 3+ matches. India fielded with 11 players in the 3-match T20I series against Australia and Sri Lanka at the start of 2016. 2 – Rishabh Pant is only the 2nd Indian wicketkeeper to bag a duck in T20I format. MS Dhoni bagged a 2nd ball duck in India’s first ever T20I in 2006 against South Africa in Johannesburg. 4/36 – Krunal Pandya became the first spinner and overall the 6th bowler to take a 4-wicket haul in T20I cricket in Australia. He is also the first Indian to claim a four-wicket haul in T20Is in Australia. Jasprit Bumrah’s 3/23 on his T20I debut in the 2016 Adelaide T20I was the previous best T20I bowling figures for an Indian in Australia. 5 – Virat Kohli’s fifty in this game is his 5th in T20Is against Australia. He is only the 2nd player to hit as many as five 50+ scores against an opponent in this format. Kusal Perera hit five T20I fifties in seven matches he played against Bangladesh. 9 – This was the 9th time where Dinesh Karthik remained unbeaten in a T20I chase and Team India has won on all the nine instances. However, his teams (India – 2; World XI – 1) lost on all three occasions whenever he got out in a T20I chase. 10 – Team India has won the 3rd match of a bilateral T20I series on all the ten occasions. They are yet to lose a bilateral T20I series in which they played three matches (Played – 10; Won – 9, Draw – 1). 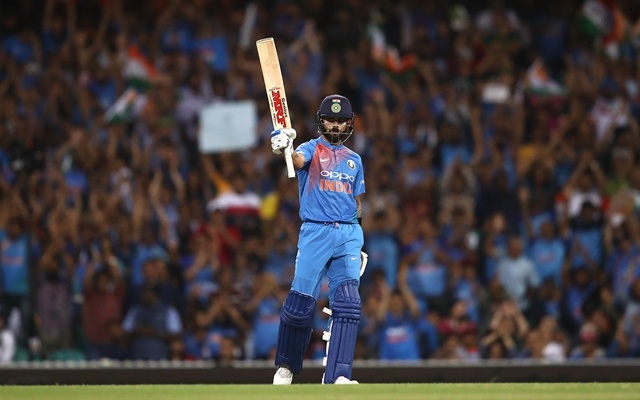 19 – Virat’s fifty is his 19th in the T20I format which is the joint most for any player equalling his teammate Rohit Sharma (4 – 100s and 15 – 50s). 61* – Kohli’s unbeaten 61 is the first T20I fifty for any visiting captain in Australia. The previous highest T20I score by a visiting captain in Australia is 49 by JP Duminy in the 2014 Melbourne T20I. 100 – The fifty-run stand between D’Arcy Short and Aaron Finch is Australia’s 100th fifty-run stand in T20I cricket. They are the second side with 100 fifty-run stands in T20I format after India who now have recorded 109 such stands including two in this match. 488 – Runs Virat Kohli scored in T20I cricket against Australia; the most runs by any player against an opponent in this format. He thus surpassed Martin Guptill’s 463 T20I runs against Pakistan.